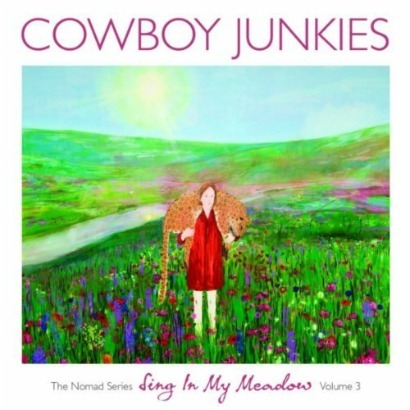 The Cowboy Junkies plunge headlong into a guitar-drenched flood of bluesy, rough-around-the-edges rock on Sing in My Meadow (Latent Recordings). The third and latest installment of their four-volume Nomad series – following the experimental, Asian-echoed volume one (Remnin Park) and the folk-rooted volume two, a tribute to the late Vic Chesnutt (Demons) – it’s the most accessible one so far and among the most brazen efforts in the veteran band’s entire catalog. Reverb and thick, corrosive riffs drive this thing, alternating between robust, menacing cuts (“Late Night Radio,” “3rd Crusade”) and comparatively abstract, mood-driven ones (“It’s Heavy Down Here,” “A Bride’s Place”). Evocative whether on the fringes of a groove or entrenched within it, Margo Timmons envelops the air more than she articulates any set of lyrics or notes. At the outset of the Nomad series, the Junkies set out to record four albums in 18 months – Sing in My Meadow took four days – an ambitious plan by just about any measure. More impressive than their efficiency, though, is how they’ve enriched each volume to date with its own respective character and theme. Prolificacy is one thing; ingenuity, executed so strikingly as this, is something else altogether. The fourth and final volume can't come soon enough.